Between 90% to 95% of your wine investment portfolio will be built with the most sought after Bordeaux wines. Even among the best Bordeaux wines, not all of them are worth investing in (see chart below). But when investing in wine there is a golden rule: DIVERSIFY! Diversification among regions, diversification within regions. Apart from Bordeaux wines, THE WINE CELLAR CLUB will seek opportunities of investing in a few Burgundy wines such as Domaine de la Romanée-Conti (DRC). THE WINE CELLAR CLUB has also developed close relationships with some of the most prestigious “Maisons de Champagne”. Sales of fine champagne have increased, with more than 300 million bottles currently sold per year. “In a year when the FTSE has had one of its worst runs in nine years - the FTSE 100 is down 13.7 for the year to October 31 - the Liv-ex Champagne 25 index, which tracks the price movement of 25 of the world’s most sought-after vintages, is only down 0.5 per cent”(source: Financial times). The top grades of champagne include Bollinger, Veuve Clicquot, Krug, Lanson, Laurent Perrier, Mercier, Moët & Chandon and Mumm. Investing in bubbles as part as your wine investment portfolio is also a wise move, it will offer balance, performances and … diversification. Bordeaux wine marketplace structure: ‘the most unusual distribution systems in the world of wine’! 100% of wine produced by the prestigious Châteaux in Bordeaux goes through the “Négoce Bordelais” (please see chart below). For centuries, the same wine merchants: courtiers and négociants, have been negotiating “allocations” with Class growth Châteaux to be allocated a certain number of bottles from the most sought after wines. 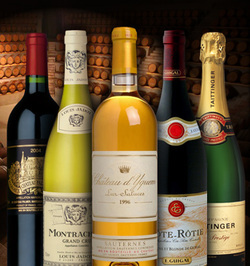 THE WINE CELLAR CLUB, who has had excellent relationships and an extensive network in Bordeaux, manages to purchase the most prestigious wines in the world at reasonable prices. THE WINE CELLAR CLUB only supplies Bordeaux wines on “La place de Bordeaux”, also called “le négoce”, because we like to buy straight from the Châteaux. This way, we ensure that the wines we buy have never left Bordeaux and never been transported in unclear conditions which would have had affected their value. All our suppliers have been carefully chosen to ensure the authenticity and quality of the wines purchased. As a pre-requisite, TWCC suppliers must belong to “L’Union des Maisons de Bordeaux” (Association of Bordeaux Wine Merchants) which is a public organization that groups together one hundred of Bordeaux’s most influential Wine Trade firms. It is thus a guarantee of quality, authenticity and competitive prices.